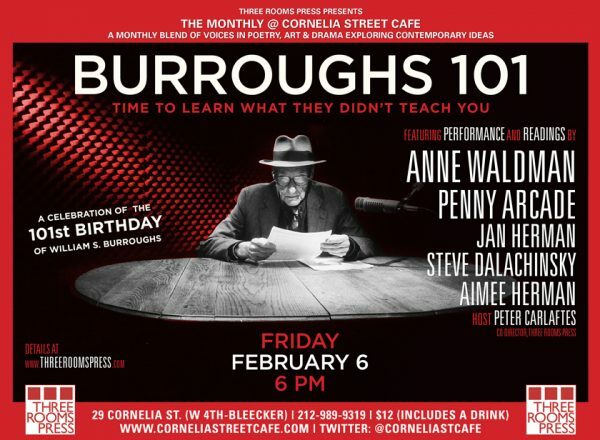 Three Rooms Press presents a 101 Year celebration of Beat icon and postmodern trailblazer William S. Burroughs on Friday, February 6, at Cornelia Street Cafe. The event will be highlighted by tribute readings and discussions by Burroughs associates and fans including internationally-acclaimed poet Anne Waldman; performance artist and playwright Penny Arcade; jazz poet and collagist Steve Dalachinsky; publisher, blogger and Burroughs historian Jan Herman; and poet Aimee Herman. Also on tap will be an audience group reading of an excerpt from Burroughs’ iconic masterpiece NAKED LUNCH. Three Rooms Press co-director Peter Carlaftes hosts. Doors open at 5:45. Admission is $12 which includes a free drink! Cornelia Street Cafe is at 29 Cornelia Street, in the West Village, between W. 4th Street at Bleecker (http://corneliastreecafe.com/). Anne Waldman is an internationally recognized and acclaimed poet, active member of the “Outrider” experimental poetry community, and writer, editor, teacher, performer, magpie scholar, infra-structure curator, and cultural/political activist. Her poetry is recognized in the lineage of Whitman and Ginsberg, and in the Beat, New York School, and Black Mountain trajectories of the New American Poetry. She is the author of more than 40 books, including the mini-classic Fast Speaking Woman, a collection of essays entitled Vow to Poetry and several selected poems editions including Helping the Dreamer, Kill or Cure and In the Room of Never Grieve. Jan Herman is a blogger, historian, publisher, and author of numerous books including of A Talent for Trouble: The Life of Hollywood’s Most Acclaimed Director, a biography of William Wyler; and Nelson Algren: Ticket to New Jersey. His blog, www.artsjournal.com covers arts, media and culture. He often writes articles discussing William Burroughs and Beat history. Steve Dalachinsky is a New York downtown poet and author of the PEN Award-winning book The Final Nite & Other Poems (2006). Dalachinsky’s main influences are the Beats, Blake, The Odyssey, obsession, socio-political angst, human disappointment, music (especially Jazz), and visual art with leanings toward abstraction. His work, for the most part is spontaneous and leans towards transforming the image rather than merely describing it, in what he now refers to as transformative description/descriptive transformation. Aimee Herman is a poet and performance artist based in Brooklyn, NY looking to disembowel the architecture of gender and what it means to queer the body. Her work has been published in The Outrider Review, nin journal, Wild Gender, and more. She is the author of the full-length poetry collection, meant to wake up feeling (great weather for MEDIA). . THE MONTHLY at Cornelia Street Cafe, hosted by Three Rooms Press, brings together writers, artists, philosophers and scientists to discuss a monthly theme. Past events have featured Code Poetry, Conspiracy Theories (on the 50th anniversary of JFK’s assassination), and illegal Leaves of Grass, an exploration of grass-related ideas from Walt Whitman to the War on Drugs.